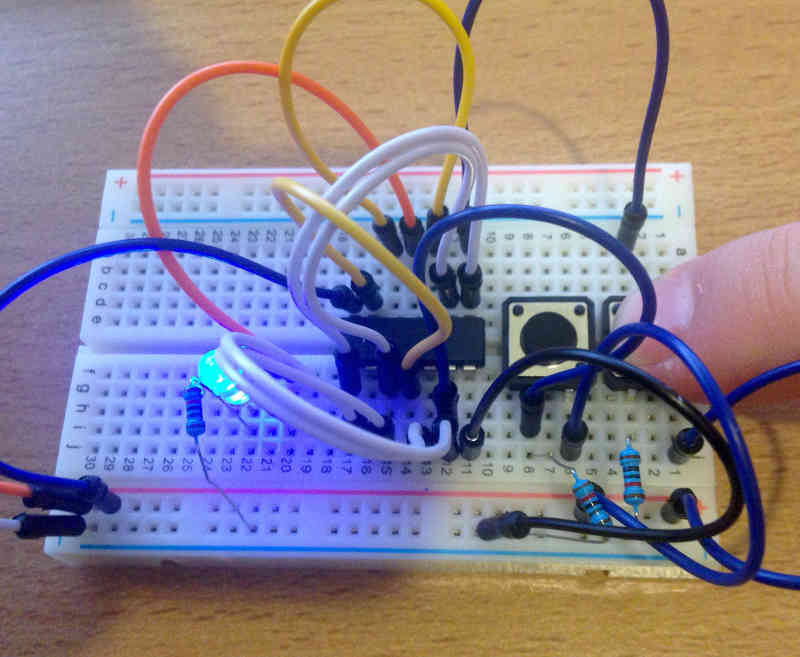 In the first installment of "A computer from scratch", I've built a NAND gate. In the third part I've built NOT, AND and OR circuits and I've also introduced the 4011 CMOS NAND gates, which I'm using instead of a bunch hand built, transistor-based NANDs (because hey, that's a lot of wiring, but not a lot of new insight). 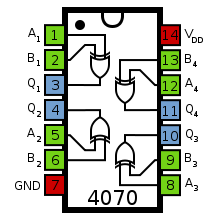 NOT, AND and OR circuits are built with one, two and three NANDs respectively. 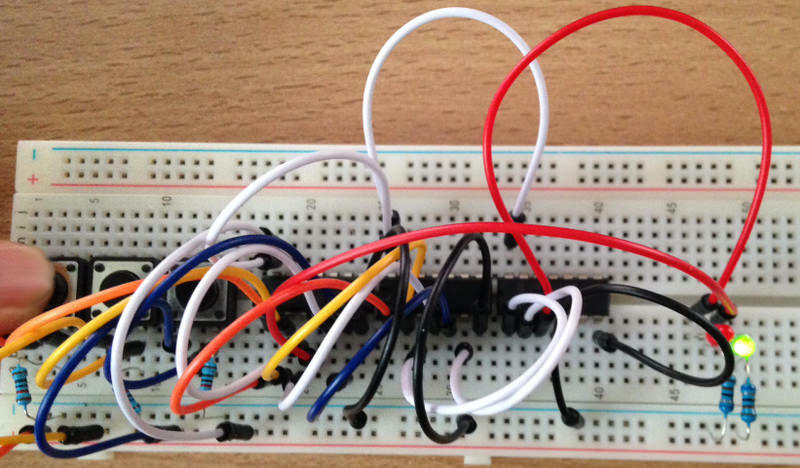 In this part, I'll first build a XOR gate, which uses four NANDs, and then a half adder, which uses six NANDs. At that point I'll build a full adder, but I'll start using pre-build XORs and ANDs for that, because that would be too many components to wire. Therefore Sh2 is the S output of the full adder, and we can also obtain Cout easily by ORing the two partial carries. 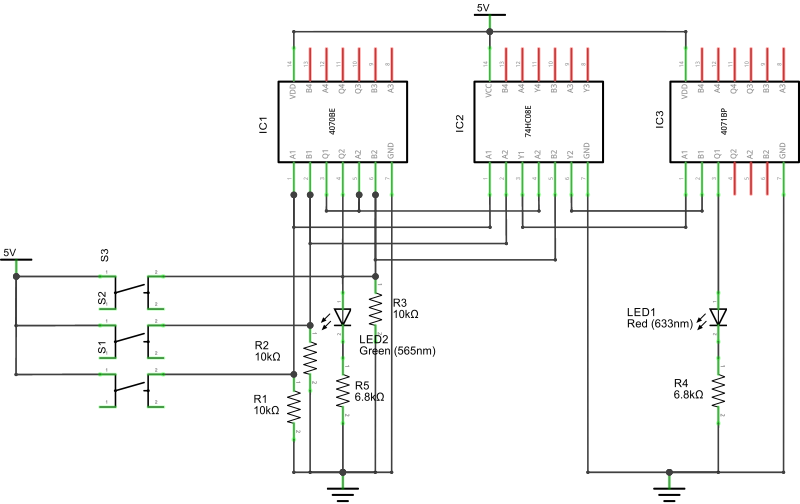 By substituting in the plans we already have for half adders and OR gates, we can derive a 15 NAND gate circuits. It's a tad too complex, so I'm cheating again by introducing three new friends: a 4-AND IC, a 4-OR IC and a 4-XOR IC. As you can see, only 2 XORs, 2 ANDs and 1 OR are necessary to build this. But first, let me introduce my new chips. 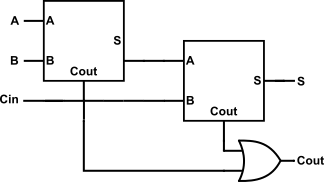 Following our diagram, we'll connect A and B to 1A and 1B; C_in and A XOR B (which is in Q1 from before) to 2A and 2B respectively. 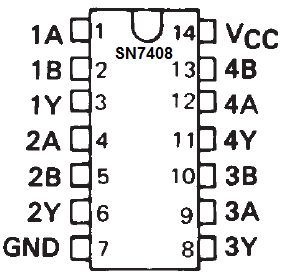 The 4071 is a 4000 series 4 OR gate. It's pinout is similar to the 4011 and 4070 IC I used before. We need to OR the two partial carries coming out of the AND gate, and so we'll connect 1Y and 2Y to A1 and B1 and get C_out in Q1. Overall the circuit looks like the following schematic. You can download a better looking PDF as well. The three switches are A, B, and C_in, respectively. The red led is C_out and the green led is S.
It works! It's a small thing but it's the first circuit I've built which actually does "something" not trivial. Before I started I had not figured out that addition and carry can be expressed as a truth table. Now I know, and my circuit does (very very simple) sums. I'm satisfied. The next steps will be to build a 2-bit "ripple carry" adder and start investigating multiplexers. With those I will be very close to my next big step: building an ALU. 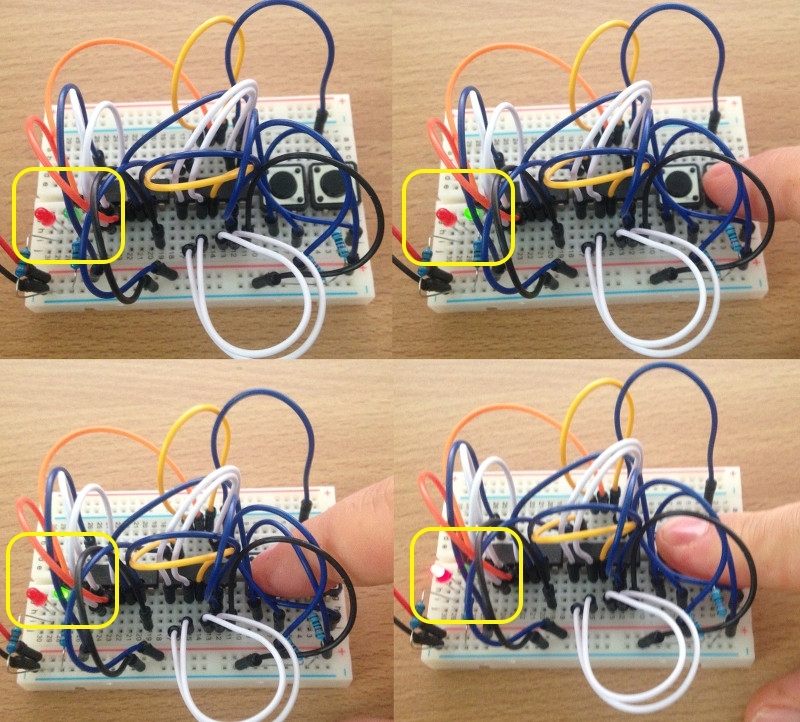 The Full Adder schematic to use with Fritzing.